RoCkaNdFRoCk: Sunglasses. What's your favourite ever? Ray bans are awesome! So are Chanel and Chloe sunnies! 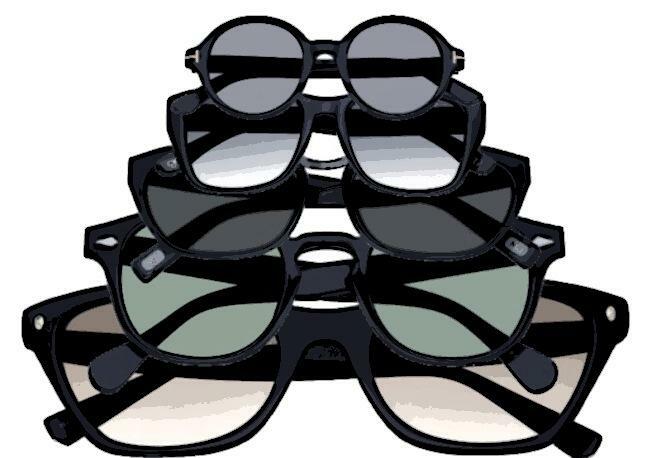 I love sunglasses... especially the black ! Chanel for me...but I have a vintage looking FCUK which I adore! I have to say... Chanel! Wayfarer! Li trovo un classico intramontabile,molto versatili e di carattere.. Fortunatamente sul mio viso stanno molto bene! Mi piacciono anche gli Audrey di Celine,che ancora non ho ma che ho intenzione di prendere tartarugati..Li trovo altrettanto chic e versatili! @artichoke I'll follow u on bloglovin! Although I don't own either pair (yet), right now it has got to be the House of Harlow Chelsea in black and Prada--the ones with the scroll sides-i don't know what the model is called. LOVE THEM! Wow! We adore these sunglasses! I love all the sunglasses!!! I love Ray Ban sunglasses, wayfarer model all the way though it's getting so typical I've been changing. I just buy cheap sunglasses, wish I could buy from a more prestigious brand. Great post! I love my Tom Ford sunglasses! Great post! nice post!! when I talking abot sunglasses my fir thought is: Audrey Hepburn!!! Thank u!!! Followed u back on both!! Following you back! Thank you :) Love your blog! Very nice blog, i love this sunglasses! Rectangle glasses like the wayfarer's do fit most face shapes that's why it's so popular. Anche a me i Wayfarer fanno lo stesso effetto. Mi piacciono talmente tanto sugli altri che ogni volta che entro in ottica me li provo sperando che stiano bene anche a me e invece no! comunque io amo i Persol. Sono i miei preferiti. Adesso alterno due paia di occhiali da sole. Entrambi vintage. Uno di mia madre di Sergio tacchina con montatura marrone. Un altro preso a firenze al Vintage selection di Byblos neri. Adoro. Non esco senza. Cambierei ogni giorno occhiali da sole. A londra, il negozio Liberty, vende certi modelli edizione limitata stupendi. I'm loyal to my Ray-Ban Wayfarers, but I also like the inexpensive versions from H&M. I don't deserve nice glasses because I lose them but I feel your love for them. Hello hun!Thanks for your sweat comment in my blog!Great blog so yes with my pleasure I would like to follow each other!I am your new reader now & I want to say that I am totally in love with Karen Walker's Sunglasses! !And classic ray-ban wayfarer of course!many kisses!